Which do you use Kitchen scale or cup measure? anyway, i moved in america. I brought my receipt from germany, too. I thought, i can figure out the math for "cup and gramm" on Internet and i believe it is easy.. Oooh noooo *grrr* I always complain with cup measure, because I want EXACT measure with butter in the cup. It looks like fool But i don't give up, so i am try to making with my cake until finish. oh.. taste horrible!!! Now, i can't use cup measure. I bought one Kitchen scale from "Bed&bath beyond". now, i am veeeeeery happy. my cake smell very good and love eat it. i feel easy with my kitchen scale. that is much much better than Cup measure, so i say true. Ooh Donauwelle, yummy!. Looks good to me. I use most cup measure, no problem for me. I think kitchen scale is a good idea I will try that. This is good for liquid. I learned that from food network. So I did followed what the instructions says. I will be making homemade pumpkin pies on Thursday...we'll have company in early evening for few hours and poker game on next day, I'll bring the rest of the pies for everyone to eat. Yep I spoils them! I will probably try make pumpkin cake or something like that. Sound yum! you said "i know" LOL yes, it is very easy, but fast baking. if you will try the kitchen scale. it would show you oz. or g. which you can option oz. or g.
Yeah, I can see that picture up there, the kitchen scale. Thanks. i use measuring cups because it's easier for me to measure tactually. when measuring butter, i simply scoop the measuring cup into the tub of butter and run the edge of a knife along the top. i do the same thing for dry ingredients. Your desserts look sooo good. I'm drooling! You could put a label on the side for gram instead of measure cup. Gee, I do understand your complaint. Oh boy, it is really hard. 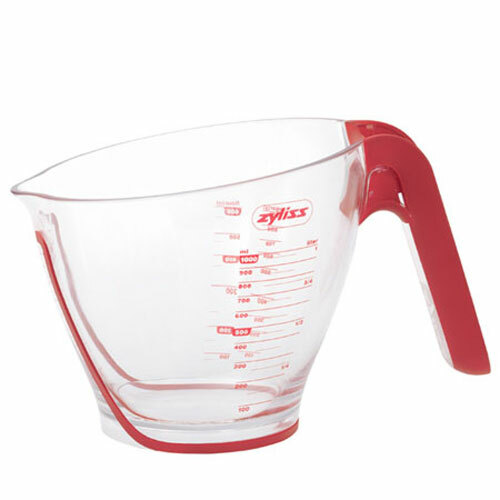 The plastic or glass bowl measure is only for liquid (butter, milk, etc). A powder or flour is used on a measure cup. They are not the same. I personally never use a plastic cup or bowl so I choose the real glass instead. LakeTahoe - I have that measure cups. I bought it two months ago. Actually, I have old aluminum cups, and I lost a 1/4 cup. I just have to live with it. I really don't know much about the kitchen scale. That's something unusual to me. What is it for? Cocaine on the scale? If I were in Germany, I will be also crazy and confuse how to use the measure. I think that American people prefer a simple measure. Perhaps, yours is more accurate for cooking. You could become a best deaf chef - like Martha Stewart from a TV show. I will be sitting in the back of the auditorium to watch you cooking something so that I at you. Smile! Always measuring cups. All my American cookbooks use this system and it works perfectly. If I move to Europe I would have to change to the new way there. yes, if you move to Europe, but will you bring your receipt cake from USA? I have everything receipt cakes from Germany. that is waste time for me, because calculator math gramm instead cup. that is why, i bought Kitchen scale. i do like a cake books from america. But that is most simply making. I don't like at all cake from america, also too sweet. No thanks! in germany have more different cake over 2.000. I love all cakes from germany and italy (tiramisu), too. You know many people just rather to buy a cake a store because they were never taught in a cooking class at a school or their parents. I would rather to say that it's their parents' fault. Yes, you are absolutely right that there are so many cakes are too sweet. Yuck! I think that some of us are very fortunate to know how to make our cakes. Once a while, I forget to add vanilla or baking soda in the mixing, and I had to start it over. I gave the cake to my dogs, and they didn't like it. Oh brother! I realized that there are two different companies that sell their own baking soda. One brand contains aluminum in the ingredient, and other brand does not have the aluminum. I am not comfortable to have the "aluminum" in the mixing. Oh, it could be a baking powder that has it, not a baking soda- ??? Sunshinelady, this link helps... I use it often when I want to bake cake to follow different countries´ receipts, like British, US, Australia and Germany. Yes, I know what you mean about American cakes, my some American co-workers baked... toooooo sweeeetttttt.... I can´t eat..... I got their recipes aus curious.... Guess what their recipes is ready mixture and too much sugar.... so I don´t use ready mixture packet but follow German intredigent and weight half sugar than their recipes... I collect some of US receipts here in AD Forum and alway use half of sugar to bake. What is it for? Cocaine on the scale? You can use less or half of sugar to bake if you follow US cake receipt. I have plenty of German and British receipt here and some US, Europe and Aussie receipts here. thank you for LINK. i already explained, what i did figure out with calculator CUP = gramm. WASTE TIME!!! no thanks!!!! i ate one muffin with food coloring. it taste good, but too sweet. I think, it could dangerous "food coloring" to habit eat more eat more eat more, non stop! Donauwelle looking good but what is a purple circle in ? Beet?